Sonos 5.4 update now live with Play:1 sound quality improvements | What Hi-Fi? The Sonos 5.4 software update brings improvements to the Play:1 audio quality, removes the need for an Ethernet connection with Sonos home cinema systems, and brings changes to the TuneIn app and a new look shuffle feature. Released in beta on Android back in May, it's now available for all - so look out for a prompt for the update on your controller. The Sonos 5.2 update brought upgrades to the Playbar sound quality, while the 5.3 update redesigned the Sonos app, and now the new 5.4 update promises a "tune-up" for the Play:1 and a fully wireless Sonos home cinema experience. Originally available in beta on Android and desktop controllers, Sonos 5.4 promises vocals will sound more natural at loud volume on the Play:1, while the bass has been optimised to improve the audio quality when partnered with the Sonos Sub. Sonos has been gradually removing the need for any ethernet connetion and now home cinema systems (any Sonos surround sound system), which still required an ethernet connection to your router somewhere, no longer require this wired connection. 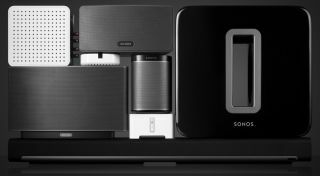 Sonos says there's no need to make an adjustment if you already have a Sonos home cinema setup but you will no longer strictly need to connect an ethernet cable to a Bridge, Boost or directly to the Playbar. There are also tweaks to the way streaming music services can work, with a new look TuneIn app promised and an improved shuffle feature across the Sonos app. Sadly, however, the update does not fix the problem with streaming BBC internet radio stations. "Beginning earlier this year, you may have experienced decreased quality and gaps in live programming while listening to your favourite BBC radio streams," says Sonos. "We apologise that this update does not fix these problems. Please know that we are working hard on a solution in partnership with TuneIn and the BBC to be released later this year." You can read more about Sonos 5.4 on the Sonos blog.